There are several ways in which memberships can be renewed. Members can renew their memberships themselves through their online profile pages. 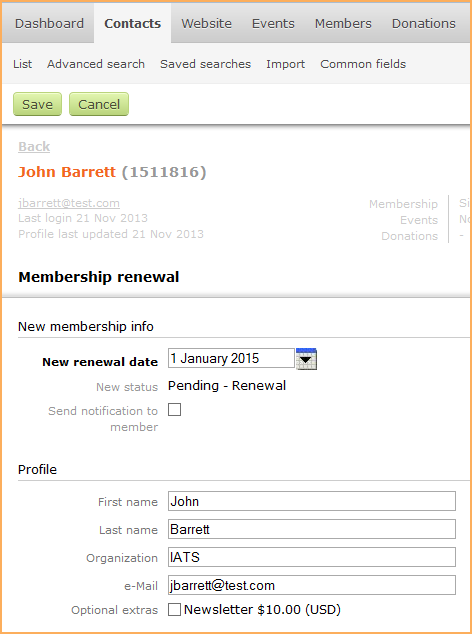 Administrators can set up automatic membership renewals. Administrators can process a membership renewal manually. Only full administrators and membership managers can process membership renewals. For more information, see Site administrators. 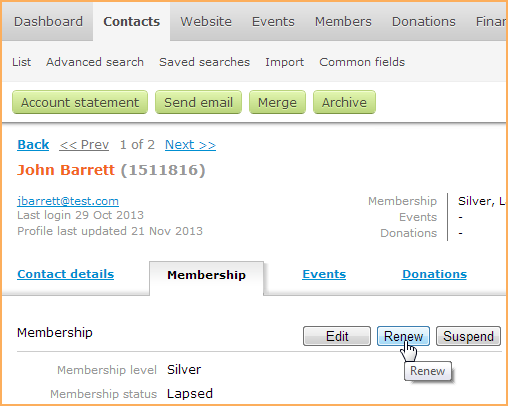 To manually renew a membership, you start by finding the member's contact record. From Membership tab on the member's contact record, click the Renew button. The Renew button only appears if the membership level renewal period is set to something other than Never, and if there is a specific renewal due date in the member record. The button will not appear for members with recurring payments. On the screen that appears, you can specify the next renewal date, choose whether to send a renewal notice to the member, and adjust common and membership field values. The membership status will be automatically set to Pending - Renewal. Activates the membership renewal without generating an invoice. Choose this option if you do not want to track this transaction in Wild Apricot. Generates an invoice for the membership renewal. The member can then pay the invoice online through their profile or by using an offline payment method (e.g. cash, check).